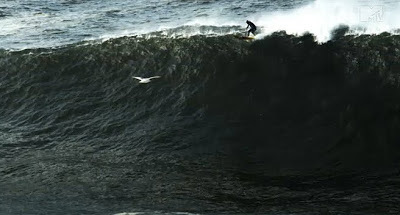 A maverick was considered a myth by surfers who couldn't believe there were any large Hawaii sized waves on the California coast. The distant waves off Pillar Point Harbor are created after a strong storm in the northern Pacific Ocean causing them to routinely crest at over 25 – 80 feet with a break caused by an unusually shaped underwater rock formation. Very few riders can become big wave surfers so mavericks were kept secret to all except a few, but today it's become an invitation only annual event. Director's Curtis Hanson (L.A. Confidential) and Michael Apted (The Chronicles of Narnia:Voyage of the Dawn Treader) teamed up with screenwriter Karlo Salem from the biographical story of American surfer Jay Moriarity. Jay became the youngest person at the age of 16 to successfully drop down a maverick. From an early age, Jay Moriarity (Jonny Weston) had a gift for sensing a wave. He figured out on his own how to count the waves which gauges the size and power of the tides. It impresses his neighbor Frosty Hesson (Gerard Butler) who saves the young Jay when he fell off the rocks into the ocean. Jay shows real promise when on his first attempt to surf he's able to stand on his busted duct taped surfboard. Now a teen, Jay is able to surf circles around his peers. One night Jay stows away on the top of Frosty's van when he goes out for a rendezvous with a few surfers to ride the maverick. Jay whose own father had abandoned he and his mom finds a father figure in Frosty begs him to let him tackle the big ones. Frosty tries to discourage him, but puts him through rigorous training to survive within a 12 week window when the waves are occurring. This includes paddle boarding from Santa Cruz to Monterrey, some 35 miles, holding his breath for 4 minutes, and facing his fears. Jay's depressed mom Kristy(Elizabeth Shue) drinks her self to sleep after her shift at Sears. She's pretty oblivious to things happening in Jay's life. Despite this Jay manages to keep a smile on his face, a positive outlook and a polite attitude to his elders. Jay is in love with his childhood friend Kimmy (Leven Rambin) who is older and although friendly with Jay still ignores him in typical teen cliche fashion. His best friend Blond (Devin Crittenden) is his surf buddy and works with him at the Pizza Paradise but he's been falling into light drug usage from the local punk Sonny (Taylor Handley). Rusty's saintly wife Brenda (Abigail Spencer) seems to be the only one working with a full deck of cards with infinite patience for her husband who is surfing more than working. The movie plays like a TV Lifetime channel inspirational story but without the usual religious overtones. Frosty encourages Jay with a Zen surfer credo to rely on the four pillars of mental, physical, emotional and spiritual strength to overcome to obstacles that he will encounter when falls off one of those tall waves. Without those elements there will be no way to survive the power of ocean crashing on him. The scenery of Northern California is breathtaking and the surfing photography is remarkable especially the monster mavericks. Butler who also executive produced the movie had a serious accident while surf training when he was knocked out by his surfboard and almost drowned. Weston was already a decent surfer before starting the film paddled 8-10 miles every morning to get into the physical mindset of his character. Big names surfers apparently also show up in the film, but unless you are familiar with the sport, their importance will elude you. The pacing of the story is slow and deliberate building on the relationship of Frosty and Jay as they help each other become complete human beings. The eye candy of Butler and the magnificent surfing keeps this film from being a total "wipe out".